John Aleis Mize, per family Bible: B: 01/17/1820 in Irvine, Estill County, KY. D: 12/22/1847. 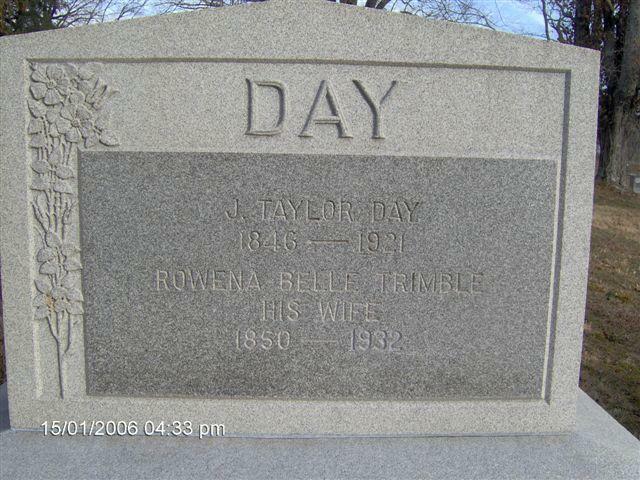 He was buried in Independence, Missouri. John owned a Merchant & Pharmacist-Drug Business. He married 11/06/1843 (11/22/1843 on Miller's 'Hist & Gen') to Marium Oldham. Marium was born 05/01/1822 Madison County, Kentucky. Daughter of William & Sallie (Gilbert) Oldham of Richman. Marium died 03/17/1858 in Clark County, Kentucky. They had two children: (Marium remarried 03/27/1951 to Thomas H. Blakemore of Richman, KY and had a son Johnny Blakemore of Independence, MO. Carl owned the Hazel Green Motion Picture House and hosted the Old Time Fiddlers Contests there. 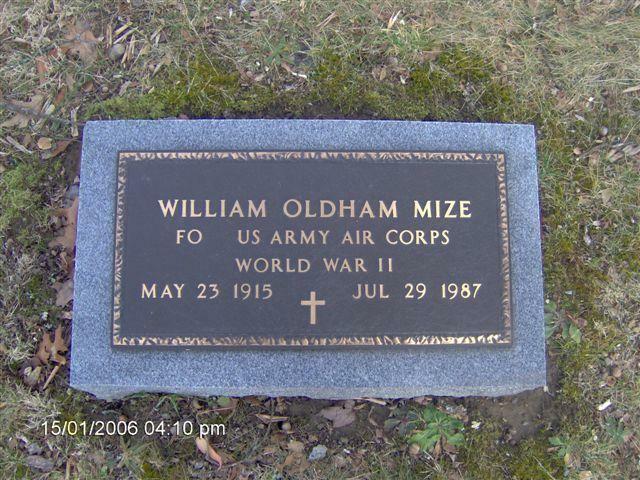 William Oldham Mize II graduated from Hazel Green Academy in 1934. William graduated from the South Plains Army Air Field of Lubbock, Texas in 11/13/1944, as a Glider Pilot. In 1942, the military established a glider school in Lubbock. Known as whisper ships, the gliders were used extensively in the airborne invasions of Burma and Normandy, carrying as much as 4200 pounds of men and equipment. Army Air Forces Glider School grew rapidly, gaining a new name, South Plains Army Flying School in May, 1942, and South Plains Army Air Field in May 3, 1943. Kentucky Colonels are unwavering in devotion to faith, family, fellowman and country. Passionate about being compassionate. Proud, yet humble. Leaders who are not ashamed to follow. Gentle but strong in will and commitment. The Honorable Order of Kentucky Colonels, as a Brotherhood, reaches out to care for our children, support those in need and preserve our rich heritage. “The Honorable Order of Kentucky Colonels, Inc. is irrevocably dedicated to and is organized and operated exclusively for charitable purposes…” Bill was a proud member, Every year, The Honorable Order of Kentucky Colonels, utilizing contributions from individual Colonels from all over the world, provides financial support to Kentucky charitable and educational institutions and organizations. Bill operated and owned several restaurants. 'Bill's Boiler' a steak house in Jacksonville Beach, the beach adolescents preferred Bills Drive-In and then the Surf Maid. And then he owned the elegant 'Le Chateau' in Atlantic Beach, located on the Florida ocean front, great for a classy evening. Bill brought Ed Kinlaw's drive-in called 'Ed's Eat' in May 1946. Located at 120 3rd Avenue North (the southwest corner with Second Street North). Ray Purdy had owned it as "Ray’s Eats" and then Fred Blas bought it and name it "Fred’s Eats." And converted it into Bills Drive-In. Mize would do more than change the name to Bill’s Drive-In and Restaurant. He expanded it into a full-scale restaurant with two dining rooms and more drive-in space. It became a popular, middle-range establishment. Sitting on the ocean front at 39 & 7th Street in Atlantic Beach, Florida from 1954 to 1985, Le Chateau restaurant and bar was elegant. Silk brocade billowing on the ceiling of the main dining room provided beauty and mystery. Breathtaking! Well-spaced chandeliers punctured the cloth. A large window overlooked the sea with lights at night so diners could see the waves while sitting at well-appointed tables. Delicious food prepared and served by an excellent staff satisfied the eye as well as the palate. The patio at the entrance alerted patrons that this was no ordinary place. The upstairs was originally living quarters, but eventually became a banquet room reached by a staircase with wrought iron rails. The building had several owners before becoming an elegant restaurant. Long before it became a restaurant, it was the home of a rich bachelor, Haydn W. “Ted” Crosby, heir to the Greenleaf and Crosby jewelry firm which owned a 12-storey building in Jacksonville at the corner of Laura and Adams Street﻿. Crosby indulged himself in building his Spanish-style, red-tiled roof oceanfront home in 1937 and furnishing it with expensive furniture and accessories. To enter, one passed through wrought iron gates into a patio with a “bathing pool.” The drawing room featured two fire places and a plate glass window facing the ocean and exposed cedar beams. The downstairs also contained a kitchen dining room, and a bathroom. Upstairs, the three bedrooms each were warmed by a fireplace; occupants enjoyed a wrought iron balcony﻿. Crosby was so proud of his new home that he opened it for a public tour on August 23, 1937. During the seven years he lived there, he entertained numerous luminaries such as the Duke of Windsor. ﻿Atlantic Beach was “nowhere” in those years, containing less than 500 hundred people, the very nice Atlantic Beach Hotel, and a few businesses along Atlantic Boulevard and Mayport Road. World War II began in Europe on September 1, 1939; the United States joined it after the Germans and their allies declared war on the US on December 11, 1941 and, in 1942, built a navy base in Mayport﻿. He sold it in 1944 to Gerry Adams who owned the neighboring Atlantic Beach Hotel. Adams renamed it as the Atlantic Beach Club. Unlike the private home, the private club had modest furnishings. At times, Adams would rent it to families according to his daughter Nancy. After a few years, Adams sold it to Jean Manget of Georgia who rented it out and used as a summer home. Manget sold it to William Oldham Mize, II. 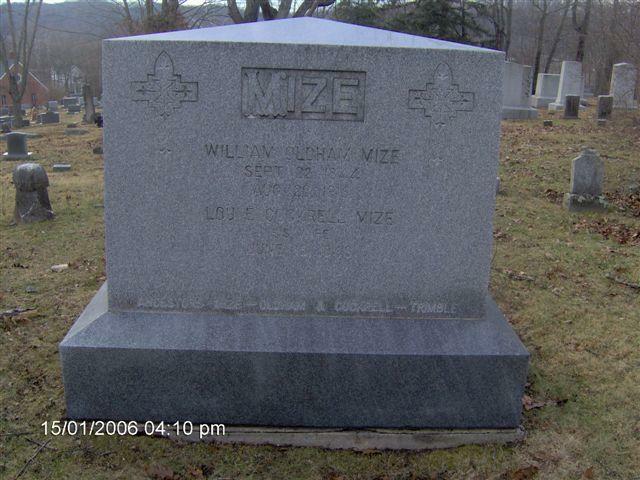 William Mize was an experienced restaurateur. A native of Hazel Green (born May 23, 1915 in Hazel Green, Kentucky) he owned and operated "The Bungalow" there, a small place 90 miles southeast of Lexington. The 1940 Bungalow ad which listed him as manager promised music by the Wayne Powell Orchestra. Mize was 25 years old. He left the restaurant business to serve as a pilot in the Army Air Corp during World War II. In 1946, he and his wife Evelyn moved to Jacksonville Beach, Florida. Preben Johansen, a Danish immigrant who arrived in the United States in 1948, bought it in 1959. Johansen and his wife, Nina Hazelhurst, had met in Munich, Germany after World War II. He was working as a translator for the U. S. Army; she worked there as a stenographer for the U. S. government for a year, plenty of time to fall in love. She went home but missed him so much that she returned to Europe and they married. In the late 1940s, the United States economy was booming, so Johansen and his American bride moved to Florida. The Johansens made Le Chateau even finer before and after Hurricane Dora demolished much of the restaurant in September, 1964. The Greek statue, La Dora, stood In the center of the tiled patio. Her beauty was highlighted by carefully placed plantings. Eventually, a piano bar was built adjacent to the patio. He hired Gene Nordan to play in the new piano bar from 1970 until it closed in 1983 and he attracted customers including such visiting luminaries as Liberace, Barry Goldwater, Betty Grable, Jane Russell, Mamie Van Doren, Victor Borge, Prince Andrew, David and Julie Eisenhower, and Taylor Caldwell. He and the bar (named La Dora Lounge in 1965) passed into legend. Bill Mize, Forester Wilkerson, Bill Bull, Harcourt Bull, Jr. The indomitable Dane rebuilt with the aid of the United States government disaster loan. It took a year. Johansen was not quite 37 years old with a wife and four children (Kathy, Preban, Jr., Kit, and Jennifer). Le Chateau provided the family with a good income and would again. He had purchased the Homestead restaurant on Beach Boulevard in 1962 from Alpha O. Paynter not many months before she died at age 75. So he had income during the year of rebuilding and modernizing. When it reopened, customers were thrilled with what the Johansens had done. The dining room was larger, a new bar adjoined the glass-enclosed patio with La Dora at the center, and a banquet room built on the second floor, reachable by an attractive staircase. Le Chateau prospered. Nina began teaching the young cooks her salad and dessert recipe. Kathy managed the restaurant from 1971-1983; Benny, as Preban, Jr. was called, co-managed and served as maître d'. Jennifer worked as hostess and cashier in 1981-82, and Kit worked summers during high school and college. Johansen was active in community life, serving as a commissioner for the City of Atlantic Beach (which named a park after him) and, after consolidation in 1968, as a District One Council member in Jacksonville, 1971-79. He had been elected City Commissioner of Atlantic Beach in October, 1981. He died on September 13, 1982, a little over a month before his 56th birthday. He had been the heart and soul of the restaurant. None of his children wanted to take on the restaurant and Nina soon decided that someone else should be given the chance. She sold it to ten investors in December, 1982 but they lacked the savvy to operate a fine restaurant and declared bankruptcy in June, 1984. Nina bought the property back from the bankruptcy court in 1985. Her efforts to find a restaurateur to operate or buy it failed. Life at the beach had changed and it was off the beaten path. So she sold it to Dan Crisp who leveled it to build a ten-unit condo complex called Le Chateau Condominiums, preserving the name of the restaurant. 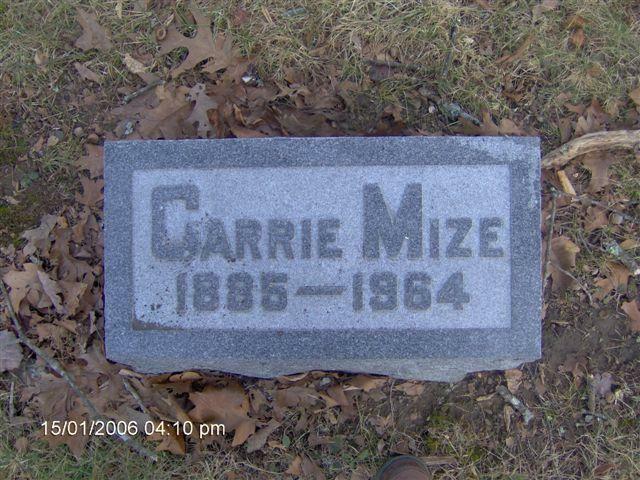 Father's Name: Mize, John A. This beautiful solid brick 2-story home has many of the original features intact, such as trim, doors, moldings, hardware, shutters, flooring, etc. yet has central heat and air, new shingles, new guttering, completely recently repainted soffits and trim, repainted and glazed windows. The first floor has a large living room with bay window, parlor with bay window, bedroom, large dining room, kitchen with breakfast area and bath. Each room has a fireplace(non-operative). The entry way and dining room have decorative hardwood flooring with a herringbone pattern and other patterns. A one-of-a-kind stairway leads to the second floor which has 4 bedrooms, each with a fireplace. The foundation is cut stone, ceilings are 11', baseboards 11", 13" interior walls, large covered front porch, blacktop driveway, storage shed, county water, natural gas and septic system. A tranquil setting among mature trees and 35 acres, with approximately 7 acres pasture and remainder in woodland, which has not been timbered since the 1940's. All mineral rights are included. Truly a property steeped in history and tradition that deserves your viewing. Antique 3-piece dining room set with 6’ table, 6 chairs, buffet and glass front china cabinet; Antique side chairs; Several old trunks; Antique 7’ wardrobe; Quilt rack; 4 cane bottom chairs; Glassware; Kitchen utensils and cookware; Old bottles; Antique corner cabinet with glass doors; Antique glass front display case; Antique beds; Antique tables; Rocking chairs; Walnut dresser with mirror and marble-top; Oak secretary with glass doors; Antique wardrobes; Figurines; Lamps; Prints; 26’ millstone; Whirlpool washer and dryer; Folding table; Kitchen table; Old alarm clocks; Old print of Governor Goebel; Antique oak map box, very unusual; Sofa; Armchairs; Glassware; Several antique dressers and chests; Many other miscellaneous items. A very nice selection of antique furniture.